There are numerous third party tools available in the market to migrate the content from SharePoint OnPremise to SharePoint Online. Sharegate is one of the most widely used migration tools. In this article, we will discuss the tips and tricks that can be useful to carry out smoother migration and avoid any common mistakes. From a SharePoint perspective, Sharegate supports two types of migration. This option helps to copy the site collections, sites, lists, libraries, permission and more directly from SharePoint (any version) to SharePoint (any version). This option is useful when we want to migrate the site from source to target environment as it is without any change in data or location. Copy content is a more granular way of migrating the content to the target environment. It helps to copy documents, list items, folders, and document sets from SharePoint (any version) to SharePoint (any version). This option is useful when we want to migrate individual content (like document, list item) selectively from source to target environment. This point is not specific to Sharegate but as a general perspective of SharePoint users. Even though after successful migration of documents, the number of documents appears less in the target location. Open Document library in SharePoint source environment. Under “Permissions and Management”, click “Manage files which have no checked in version”. Click “Take ownership of selection”. Switch back to Sharegate, refresh the view. The missing documents should be now available to migrate. It is always preferable to use the insane mode to copy documents faster to source SharePoint environment. Here, we can also specify the custom storage account to use. Also, the insane mode will help to maintain the IDs of items from the source environment. In SharePoint, we commonly use Choice fields as part of our information architecture. The major issue with using choice field is that it does not keep track of changed values. Notice how the Approved status is broken down to support the business process. In this scenario, the items in the list which were created before with Status as Approved remain as they were. SharePoint does not complain about it. But when it comes to migration as we are no longer supporting “Approved” status, the items tagged with the “Approved” status start to complain. At this point, it might not be feasible to go back and change all approval statuses. A simple resolution to this is to set the problematic choice column to allow fill-in choices. This will allow Sharegate to enter any value in the choice column and proceed with the migration. When any document has huge versions, it might occur that a few versions go missing. Sharegate simply skips the versions. To resolve this kind of issue, simply re-migrate the document with any of the below options. Lists which have lookup are always troublesome to migrate. Firstly identify and start from parent list to avoid any reworking of migration. Another solution is to set the default value in Sharegate to use when the source item contains an invalid value for the destination lookup column. Sharegate provides the best support to resolve our migration issues. For any outstanding issues, we can email support@sharegate.com and their representative will help us further. Sharegate is one of the best migration tools available in the market. We cannot consider the migration will be always as easy as lifting and shifting the content. We may face few challenges due to data inconsistency. The above tips and tricks will definitely help to tackle common behaviors. Often, in forums and SharePoint events, I receive a query on how to get all the attachments from all items in a SharePoint List. We can achieve this in several different ways as mentioned below. Mapping the attachments folder to File Share. First of all, create a SharePoint Framework webpart project using the Yeoman generator with the following command. After the creation of the project, add the PnP JS library dependencies by running the following npm commmand. To access the item and attachment objects using PnP library, add the following import statements to the webpart’s TypeScript file. If we want to download or upload the attachment files from the webpart, we have to include the following import statement below the sp import statement. To show the attachments from all list items in a webpart, add the below methods under the _WebPart class within the _webpart.ts file. The getSPData() method gets the attachment files from all items from the list “My List“. Add the “Attachments eq 1” to the filter to retrieve the items which contain attachments. Use the expand method to get the attachment files of the list items in a single request. In response, we are generating the HTML as a list of attachment files with the associated Item Id and Title. The renderData() method adds the generated HTML to the webpart.Replace the render() method with the below code snippet. This is used to call the getSPData() and update the retrieved values within the element pnpinfo. After running the webpart in the SharePoint page, it will display the Item id, title, and attachments. It will be nice to have a download link in the attachment file. Replace the above line with the following code snippet. Then, the webpart renders the download link of each attachment file. After importing the PnP JS dependencies, import the classes from PnP JS to the web part by adding below lines in the _webpart.ts file. So the object is the starting point for accessing all the SharePoint related PnP objects and methods. CurrentUser object returns the following properties for now. In the future, it may change based on the new properties introduced to the SharePoint and open source contributions to this library. We have to import CurrentUser object from SiteUsers class from the @pnp/sp. Add the below code snippet under the _WebPart class in _webpart.ts file in the project. getSPData method calls the PnP request method to fetch the current users’ data from SharePoint. renderData method is used to generate the HTML and pass the value for rendering. Render method renders the HTML in the browser. Below is the output based on the code snippet. This returns the current user title value. We can also use other user properties to display in the webpart. Based on the current user, we can also get the groups where the current user is the member. CurrentUser.Groups return the collection of SharePoint Groups associated with the current user. Replace the getSPData method with the following code, which is used to fetch the groups associated by the current user in SharePoint site. In this article, I will introduce you to an online service I created that allows you to code against certain services without using an SDK, simply by sending HTTPS REST commands. In this article, I will demonstrate how this works against SharePoint Online; however other services are also available. Please note that I built this service with the community in mind, and as a result, it is free for simple use. The service stores your configuration settings securely so that the actual service secrets (such as your SharePoint password) are not stored on the client code. Developing without an SDK makes it much easier to code IoT, web and Mobile projects, and works regardless of the operating system or programming language. That’s because you can make simple REST commands instead of using an SDK; the call returns a JSON payload with the data. Let’s see how we can fetch SharePoint List Items using a simple HTTP REST command. The REST method to call is called GetListItemEx. Let’s first look at a raw HTTP command that you can send using Postman for example. There are a few variables to change, which we will review. For example, the following Postman screenshot shows you the REST command I sent to my server, which in turn connected to SharePoint Online to fetch items from the US States list. The name of the configuration is called sharepointroggero (we will see this shortly). 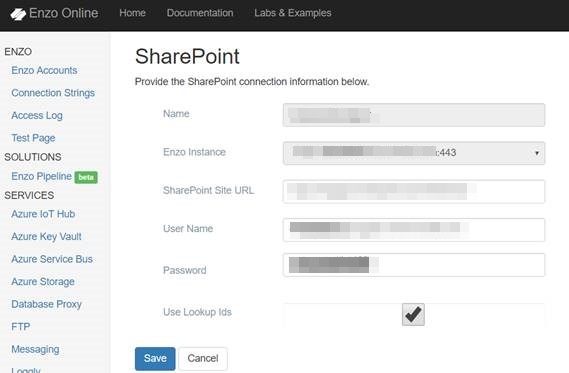 As you can see, there are no SharePoint-specific secrets here; all the details are stored on the portal under the configuration setting called sharepointroggero. Let’s go to the portal and review the configuration settings; once you log in to the portal, click on the SharePoint service on the left, and click on Create. You will see a screen similar to this where you can store your configuration settings. Now let’s create a small C# Console project to make the same REST call. To try the following source code, you will need to sign up on the Enzo Online portal here, create a configuration setting for SharePoint Online and access your Enzo URI and AuthToken by selecting Enzo Accounts from the menu. The code does essentially the same thing as above: it retrieves the content of a list called MyList using a configuration setting called myconfigname. As discussed previously, this code does not use the SharePoint SDK; it relies entirely on HTTPS REST calls. Similarly, here is a Python sample code that does essentially the same thing. 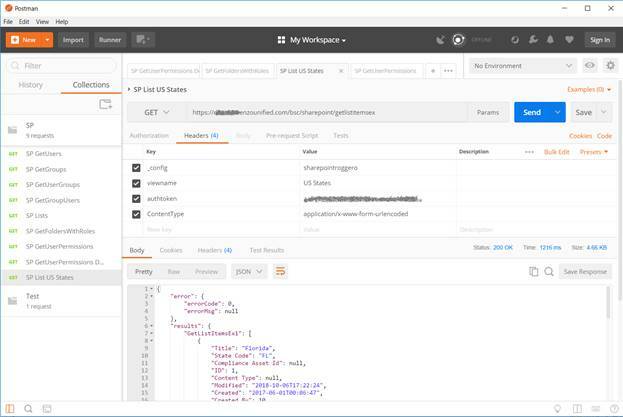 The purpose of this article was to introduce you to a new development approach that simplifies development, and removes complex SDKs from client code using SharePoint as an example. Additional documentation and sample code is available online. We have a SharePoint 2013 farm and were retracting a solution; we were using Chrome browser. In the browser our site was open in two tabs and in one tab was central admin. When we were trying to retract a solution through central admin we were getting an “Access Denied” error. We are logged in with user having Administrator rights so it seems not to be a user permission issue. It was a very small fix but I thought to share, as maybe it can save you time. It seems to be a weird error. No user permission issue. We Googled a lot and then got the below article related to the same issue but not the exact one. In the above article the exact issue isn’t mentioned but at least we got an idea. We have closed the browser, opened the central admin again with the run as administrator option, tried again and it worked like a charm. 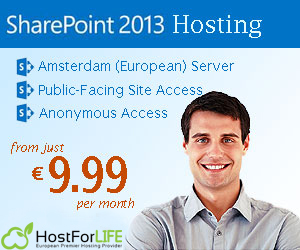 SharePoint 2013 Hosting – HostForLIFE.eu :: How to Create And Use Task List In SharePoint 2013? 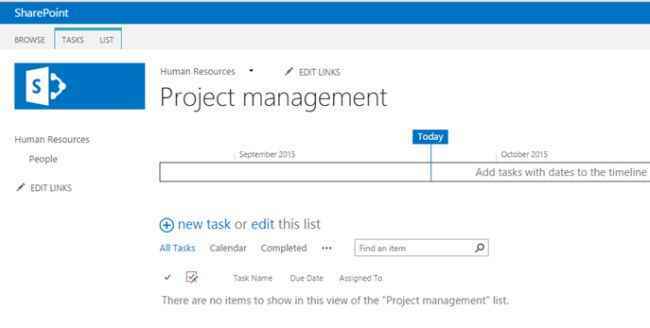 This post will explain you about create task list in SharePoint 2013. Using task list can in SharePoint to track your daily activities, assign task to team members, track due date for daily activities, etc. 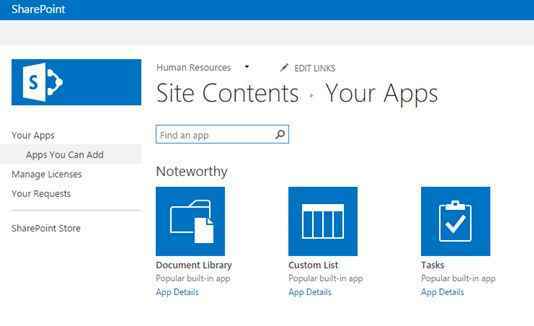 First, open SharePoint site. Now, select the Site settings and Add an app. Click on Task app to create. Provide the name for the task list. Click Create. So the new task list has been created successfully. So here’s the task list with timeline. 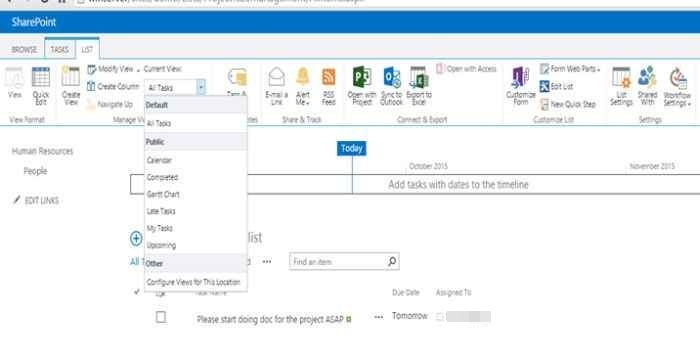 In SharePoint 2013 we have a timeline feature in the task list to track your daily task activities. Now I am going to assign a task to my team member. Click on new task. Provide the name for the task. Provide the task start date and due date. Assigned to ‘Assign the task to any of your team member’. Set priority to Low, High, Normal. Update the status of the task. Fill the description if u needed and add predecessors. So the new task has been assigned successfully.